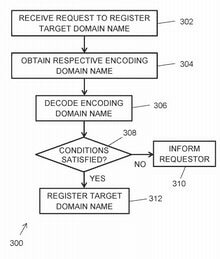 Concepts in patent could help domain owners sell more domains. 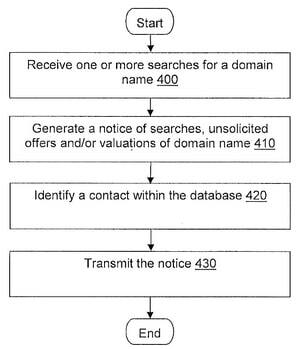 The United States Patent and Trademark Office has granted a patent to GoDaddy for “Notifying registrants of domain name valuations”. 1. Notifying domain searchers if a domain becomes available. The patent states that 65% of searches today result in a user not finding the available domain they originally searched. (Note: the patent application was filed in January 2015). So GoDaddy describes a system that monitors domain names people search for and notifies them if they later become available due to a) the domain expiring or b) the domain owner offering it for sale in the aftermarket (or indicating they are willing to sell it). The notifications may be limited so they don’t trigger if too much time has passed between the search and the availability. 2. Enabling communication between a domain searcher and domain owner to facilitate a transaction. If the domain owner opts in, there could be a way for a domain searcher to contact the domain owner with an offer to buy the domain name. There might also be some sort of domain valuation that occurs as part of this process. The patent states that should domain owners have success selling domains, it might incentivize them to consolidate their portfolio and listed it for sale in the domain aftermarket. GoDaddy GM Michael Mclaughlin and VP of Product Management Tapan Kamdar are listed as the inventors. Patent is related to its system for monitoring domains not registered at Uniregistry. The U.S. Patent and Trademark Office has granted patent number 9,807,053 (pdf) to Uniregistry for “System and method related to domain name tracking and transfer”. What is described is a system and method providing an improved customer experience for the Registrant. The Registrant is able to use a single interface to monitor multiple domain names as well as to transfer its domain names between Registrars. 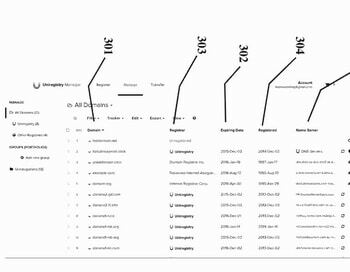 The single interaction with the single interface works out just as well and just as conveniently regardless of whether at the time a Registrant commences use of the system, a single Registrar happens to be handling all of the domain names, or whether each domain name is handled by a different Registrar. Frank Schilling and Ryan Smith are listed as inventors. The patent was filed in August 2015 but was based on a provisional application filed in August 2014.